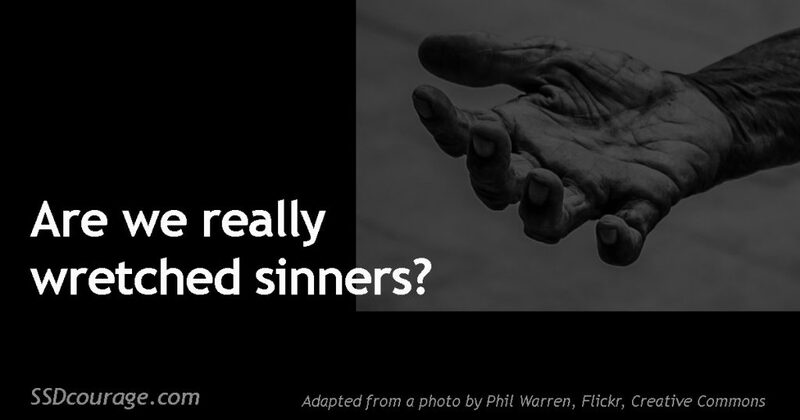 Are we really wretched sinners? Today’s post will be longer than most, but I want to clear up some confusion about who we are and why it matters. What gives? If Paul, a great leader, pioneer, and example to us all couldn’t overcome sin, what hope do the rest of us have? To make sense of this passage, we need to return to the first rule of Bible interpretation: Consider the context. How does this passage fit into the flow of thought throughout the entire book of Romans? How does it fit the times in which it was written? How does it fit into the flow of thought for the entire Bible? When this passage was originally written, there were no chapter divisions, no verse divisions. I’m sure Paul never imagined that anyone would consider this passage all by itself without taking into account everything he said before and after. So what does he say before and after? In the book of Romans, Paul asks and answers a big question: What kind of goodness puts you right with God? Do we Christians have a split personality? In many translations of Romans 7, Paul talks about our “sinful nature.” “Sinful nature” is, I think, a misleading translation. It gives the idea that Christians have a dual identity—a redeemed nature and a sinful nature. That’s what I believed for years and years. I have a good nature and a bad nature, and my sin nature gets me into all kinds of trouble. No matter how hard I try, I will mess up, because I have a sinful nature. Millions of Christians believe this. But I don’t believe it any more. I’ll explain why, and I’ll explain why I think it’s so very important to get this straight. “Sinful nature” is more accurately translated “flesh.” Go to BibleGateway.com, turn to the New American Standard Bible (NASB), and do a search for the word “flesh.” You’ll find a couple hundred passages including passages like 2 Chronicles 32:8 that makes it clear that “flesh” often means human effort apart from God (and often in opposition to God). Whenever “flesh” is contrasted to God or God’s Spirit, “flesh” shows up as weak, failing, corruptible. So what does “flesh” mean in this context? I would describe it as human effort apart from God. Remember, Paul is writing to a mixed group. Some of the people receiving his letter were putting their hope in the Old Testament law rather than putting their hope in Jesus. That was a problem. What do we learn in Romans 6? We learn that our old self is dead. The you with a propensity for sin (call it your sin nature if you want)—it’s dead. We have died to sin. Because we died to sin, we are no longer slaves to sin. Sin does not control us. Sin doesn’t call the shots; we do. Something that’s dead isn’t simultaneously alive. Sorry. It doesn’t work like that. If it’s dead, it’s dead. Something that’s dead isn’t alive, well, and active in your life. It’s dead. In the coffin. Buried. Underground. Gone. Dead. This isn’t just nice sounding Christian words. This is reality—a far different reality than most Christians believe. Romans 6 states, “For sin shall no longer be your master, because you are not under the law, but under grace.” Not only have we died to sin, but we have died to the Old Testament law. (See Romans 7:1-4.) We need to be very careful to understand what that means. It doesn’t mean that we throw away God’s moral code. Murder is still wrong. Stealing is still wrong. Adultery is still wrong. What it DOES mean is this: our goodness comes from a different place. It doesn’t come from human effort apart from God (flesh). It doesn’t come from obeying a set of rules. Instead, it comes from our union with Jesus where His desires become our desires, His wishes our wishes. So what is Romans 7 about? Instead, Romans 7:14-24 is merely a description of what life would be if our sinful nature wasn’t dead and we had to rely on human effort apart from God to keep the Old Testament law in order to be right with God. At the end of Romans 7, Paul asks the question: “Who will deliver me from this body of death?” Then he answers it, “Thanks be to God, who delivers me through Jesus Christ. In chapter 8, one of the most triumphant chapters of the entire Bible, he expands on that answer. We are set free from the law of sin and death. We live according to the Spirit. We don’t live by the flesh. Our present sufferings are nothing compared to what God has for us. God’s Spirit prays for us. Everything works together for our good. Let me explain it like this: I’m Dwight Clough. I act like Dwight Clough. When I wake up in the morning, I don’t stand in front of the mirror and give myself a little pep talk, “Okay, Dwight, today I want you to try really hard to act like Dwight Clough.” Nonsense. I don’t need to try. Dwight Clough is who I am. Once in a while I do something that is out of character for me. But this is the exception. As a rule, I act like Dwight Clough because I am Dwight Clough. We act out of our identity. Who we are determines what we do. In the book of Romans, Paul makes a compelling case about who we are. We are God’s children, led by His Spirit, free from the control of sin, dead to the demands of the law, alive to the desires of God. That is who we are. And we will act from our identity. So, why the struggle with sin? Okay, if all this is true, then why does Romans 7 sound so real to so many Christians? Why do we struggle with sin? Let me suggest that the culprit is deception. I’ve written about this extensively elsewhere, but I’ll summarize here: Deep down (often below our everyday awareness), we believe lies about ourselves, about God, about our world. Those lies cause pain. We try to medicate that pain with inadequate solutions. Those solutions are sin. But Jesus says we shall know the truth, and the truth shall set us free. (John 8:32) For the Christian, one of the most important things we can do is receive truth from Jesus in those hurting places in our lives. As we do, all of this will sound a whole lot less like abstract theory and a whole lot more like every day reality.